When I arrived at City Hall I found the lovely Stacey Butler of Channels 2/9 sitting in a van with her cameraman, waiting for the meeting to begin. I walked over to her and said, "Well, I guess all it takes to get you out here is Matt Leinert, huh?" She smiled and said, "Yep". They covered the early stages of the FUAP issue, then departed. Nobody named Leinart showed up. Following some brief public comments in which Beth Refakes, a member of the Military Affairs Team, reminded us that they are collecting used ball gowns for the women of our adopted Marine battalion, the 1/5 Marines. 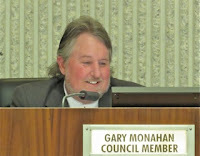 Rocky Evans also stepped up again to ask for an extension of hours at the Skate Park. 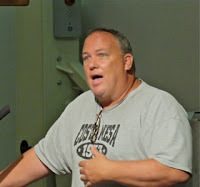 He talks about both the Leinart football program and the Friday Night Lights (FNL) program, which have been operating side-by-side at the Jack Hammett Sports Complex this past season. Ironically, last year there was a similar problem with FNL which resulted in that operation being charged fees retroactively on a payment schedule. And, in that letter you'll notice Hatch used some peculiar phrases. 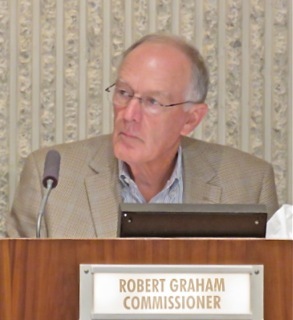 For example, addressing the FNL and Leinart programs, he said that while both operate quality programs, "there are concerns about the vicious competition that is occurring." Later he said, "the competition appears too profit-focused and unhealthy." This may be THE most weird official communication I've ever seen come from City Hall. Please take a few minutes to enlarge it and read it. 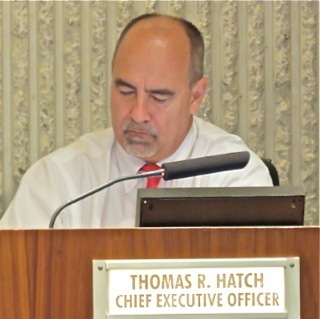 Immediately after Hatch spoke - read - Commissioner Byron De Arakal spoke and said he was asking the Leinart folks to step up and agree to pay the back fees to avoid any lengthy analysis and investigation. Subsequently, Leinart representative Frank Albers - long time Costa Mesa High School Football coach and now a coach at Calvary Chapel High School and who works for the Leinart Program - agreed to that request. It's not clear that he has the authority to make that commitment and no other person representing the Leinart program spoke last night. More on that issue later. They made short work of the first agenda item - the plant palette for medians along Mesa Verde Drive East and California Street, HERE. In 20 minutes flat they heard the presentation and voted on choice 2A. Then began the long, herky-jerky journey through the FUAP process - a trip that ended three hours later, during which we saw fifteen (15) people speak (some twice! ), commissioners wrestle over minor and major changes in the policy and confusion reigning when the final vote was taken. First off, I had a strong sense of deja vu, since many of the members of the audience last night were also there for the budget meeting Tuesday, when youth sports was also the cause dujour. There was so much testosterone in the room one could close his eyes and think he was in a football locker room. 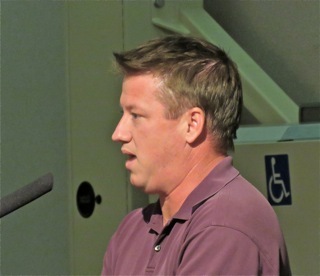 Recreation Manager Travis Karlen led the discussion of the new policy, addressing the reasoning behind the changes - there was a lot of "cleaning up" to be done, plus some significant clarification of terms and some re-definition of some issues. He also spoke of field use in the terms of the practice by some groups of "splitting fields" - taking a full field and fracturing it into several pieces to facilitate practices and games with larger groups. That discussion thread carried through the entire 180 minute conversations. Much of the discussion revolved around issues at the Jack Hammett Sports Complex, our premiere sports facility, where fields are highly prized and where both the Leinart and FNL programs co-exist - barely. Issues were wear-and-tear on the fields, safety and parking. 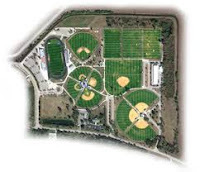 The facility was designed, both from a field-use standpoint and from a parking standpoint, for 132 players on the fields at any one time. Overflow parking is not readily available, although it might be accessible when construction at Costa Mesa High School is completed. The issue of "splitting" of fields was discussed, with the question broached about proper charges if, for example, four-times the number of players are occupying one field because it has been fragmented for that use. Threshold numbers for Costa Mesa residents were also discussed for several user group designations, but not resolved at that time. 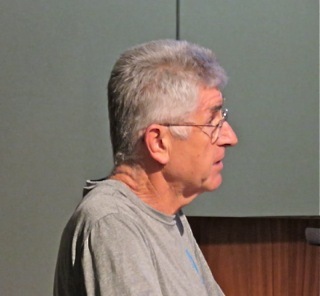 When representatives of user groups were permitted to address the commission, the aforementioned Frank Albers stepped up and committed that group to pay the back fees. He indicated they were a good corporate neighbor and were grateful for a place to play. He said they didn't "compete" with FNL, but you could see that may not have been entirely accurate. He said, "We're not trying to move anybody out." a couple times. He indicated that when they split the fields they might have 24 kids playing at any one time. Representatives from AYSO 97 and AYSO 120 plus the Newport Harbor Baseball Program spoke about their operations. Then Scott Mahaffy, representing Friday Night Lights, stepped up. Addressing Albers' comments, he said there are "no negatives from us." As the conversation moved a long it certainly did sound like there is anything BUT a friendly relationship between the two programs. 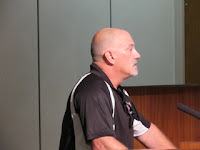 He expressed concern about the equitability of field distribution, indicating that the Leinart program had three fields for 200 kids and FNL had three fields for more than 800. 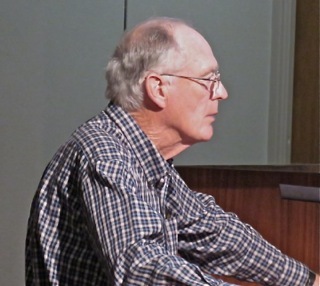 He told us that they might split their fields into 4, 4 and 3 for a total of 11 playing venues and that they might have 132 kids playing at any one time - precisely the number Jack Hammett was designed for. (I found myself thinking, "Yeah, on half the fields!"). 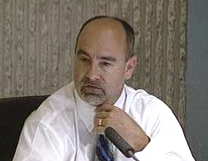 That issue got batted around by Commissioner de Arakal, who was attempting to get the actual numbers from Mahaffy. He never really did get the number. And, when pressed later by Commissioner Don Harper, Mahaffy acknowledged that there might be 8 kids per side per field, counting substitutes, for a total of 16, not 12 playing in a game on one section of "split"field. De Arakal tried to sort out how many "games" might be played each night - unsuccessfully. Here's what I took away from that conversation. The three (3) FNL fields might be fractured into 11 individual playing venues, on which there would be 8 kids (including subs) playing at any one time on a side, for a total of 16 per game. 16X11=176. However, there could be as many as four (4) games played on each field each Friday night. 4X176=704. And, considering that Mahaffy previously told us that he had 860 kids in his program, that number actually seems pretty conservative. Albers didn't tell us how many games they played each Friday night, but if you presume they also play four per field, that would give you 4X24 =96, so it certainly looks like 800 kids might be playing on the six Jack Hammett fields every Friday night during their season. That's a lot of traffic in and out and certainly would fit the description provided by many speakers last night that it's a party atmosphere. AND it explains the City concern about safety and parking. At one point the issue of the ratio of Costa Mesa kids playing on each program came up. 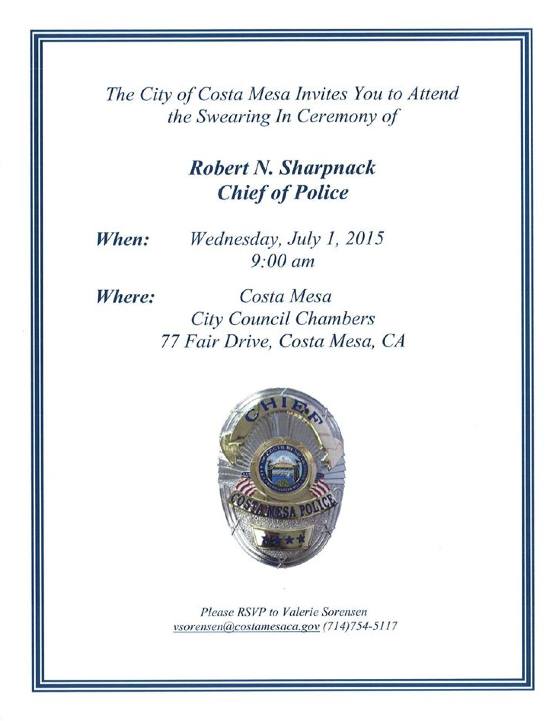 It was stated that only 14% of the Leinart kids were from Costa Mesa - which rocked back all the commissioners. Later speaker Chris Cox, who works for Lienart, denied that number. Of those parents and who addressed this issue, far and away most were in favor of FNL, citing the "family atmosphere" of the program. Only Albers and Cox - also a coach at Calvary Chapel and also a coach with the Leinart program - spoke in favor of that program. And, as part of the agenda packet there were twenty (20) letters on this subject, of which 17 were in favor of FNL. The remainder were either against both or against the Leinart program. The FNL letters appeared to have been driven by a set of talking points. Clearly, that side of the equation was much more organized. When the discussion turned to making changes to the proposed policy, de Arakal took the lead and attempted to get seven changes made. He was successful in getting his peers to agree to add language defining the authority of the Assistant CEO in some decision-making segments. He did not get support to require proof of residency for the kids and also failed to get support for the elimination of Group 6 (non-Costa Mesa adults) programs and fold them into Group 4 with a change in that definition. It was a 2-2 vote with Commissioner Harper abstaining - something he did several more times last night. It also happened on a vote to change the demographic for Group 3 users. That was troubling for me. If he's not going to vote he might just as well stay home. He never did give an explanation for a couple of his abstentions. Very odd. 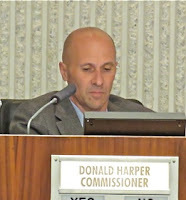 When the final two votes - the ones requested by the staff - came up, the first one approving the FUAP with changes previously approved passed, 4-0, with Harper AGAIN abstaining. The second vote, which gave permanent Group 1 status to AYSO 97, Newport Harbor Baseball Association and Newport Mesa Girls Softball, passed, 5-0. Confusion came when the issue of the extension for a year of the Group 3 status for the Leinart program was NOT included in that vote. Before the earlier vote was taken de Arakal confirmed with Karlen that the Leinart program was still a Group 3 program, which is why it was NOT included in the vote. Following the break Harper asked the clerk to read the issue they voted on, because he thought there was confusion. She read the entire paragraph, including the Leinart reference. When I got home I checked my recording. That was NOT included in the vote. Further conversation with staff confirmed that the Leinart remains a Group 3 user group. The only issue remaining is whether or not it is a legitimate non-profit organization - their representative, Albers, acknowledged it is not when he agreed to pay the required fees. And, there is the membership percentage that needs to be fleshed out. It certainly is NOT qualified to be a Group 3 User with only 14% of the kids being from Costa Mesa. If that's the case - or if that number is anywhere close to it - the Leinart program would default to Group 5 user status and make it difficult for them to qualify for premium field use. It was clear to me last night that there needs to be a mechanism to accurately determine the residency and/or other qualifications for every child participating in these programs so the fields can be honestly allocated. 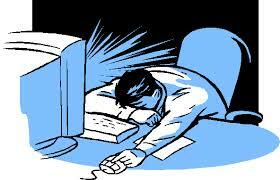 Concerns about the legality and availability of the data quashed that process last night. This new policy will be sent to the City Council for approval in July so user groups can get on with their fall registrations. According to the staff, there really is no wiggle time available. It is hoped that the "Leinart" issues will be resolved by then. It was quite ironic last night, as I sat there and listened to speaker after speaker extol the virtues of their various programs - citing the life-lessons the kids learn, like sportsmanship, hard work, teamwork, leadership and all the other obvious lessons one gets from playing a team sport coached by strong leaders - realizing that the two programs that got the most discussion last night, FNL and Leinart, both exist under huge clouds involving the honesty and integrity of their leadership. It just seemed out of whack to me. This segment of the meeting ended at 9:57 p.m. The placement of a "temporary for one month" bench in Fairview Park requested by Graham took ten minutes and resulted in the bench being placed there permanently. 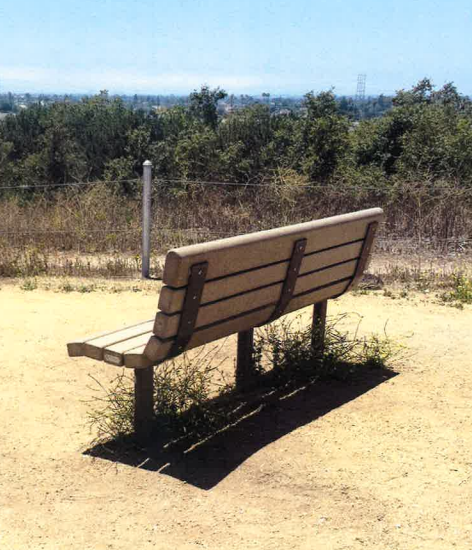 The commissioners felt no "study" was necessary and it was within their purview to order the bench installed. Graham was happy. The two separate tree removal requests moved briskly. 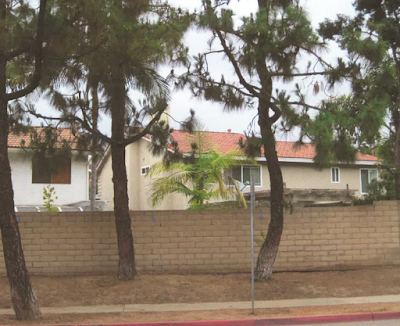 The first one, at 871 Prospect, resulted in both trees being approved for removal. The second one resulted in one of the two being approved for removal. This seems like an every-meeting occurrence, since there has been ongoing dialogue between the staff and the neighbors who live in that enclave near the ramps from Bear Street to the 73 Freeway. 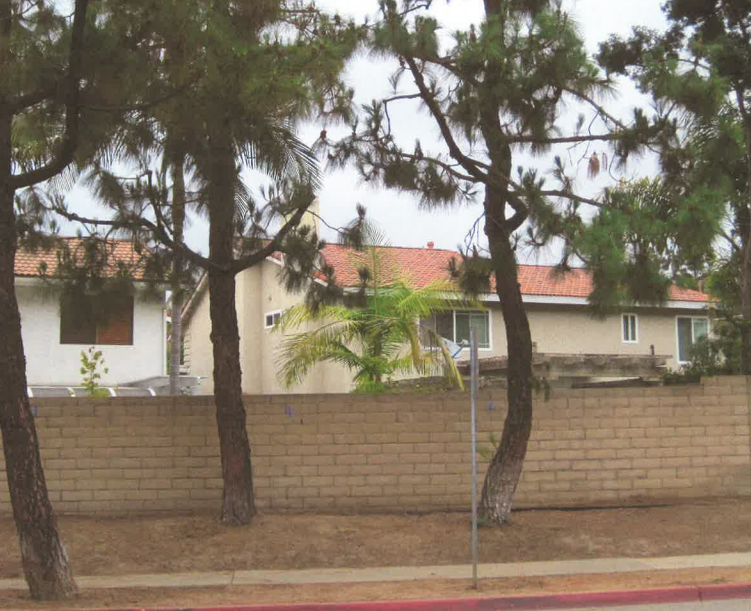 Canary Island Pines, planted by the developer decades ago, have begun to destroy the block walls in that neighborhood. 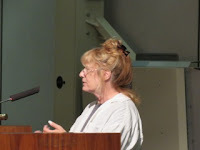 So far, only one neighbor has opposed the tree removal requests - she also appeared last night and sat as far from the other eight neighbors in the auditorium as she could during the proceedings. The others spoke in support of the removals. Both items were completed by 11:00. Parks Project Manager Bart Mejia gave a very brief report on the status of some pending projects, including the launch of the consultant study for the update of the Parks Master Plan. We were out of there at 11:15 p.m. - the same day, for a change. However, in case you're among the two or three people who have NOT heard about this - and because it is part of the Costa Mesa Parks and Recreation Commission agenda tonight, HERE - I feel compelled to provide some information on it. The shortest version I can provide is, according to the article, the Matt Leinart Flag Football program apparently used the non-profit status of a separate foundation to get special treatment for field use in Costa Mesa - and, apparently, other cities as well. This is seriously problematic anywhere, but especially in Costa Mesa, where user groups have been screaming for more fields for the children of our community for years! To have a for-profit group elbow its way up the line to get rare premium field space using false information is unconscionable - at least. Knapp said he thought the access to those fields should be granted to other sports organizations that had greater interest in the community and because the city was already renting field space to another flag football league. Knapp said he was also uneasy because the Leinart league did not meet requirements for having certain percentages of participants that are Costa Mesa residents. The article also discusses financial contributions made to Costa Mesa school youth sports groups by the Leinart group. As I said, this is seriously problematic and casts a huge shadow over how city officials handled this matter. 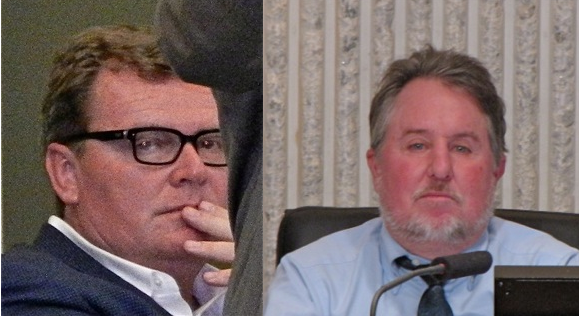 The roles played by Mensinger, Monahan and the direction apparently given by CEO Tom Hatch require some explanation. 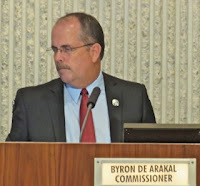 Tonight, at the Costa Mesa Parks and Recreation Commission meeting, we all should have a chance to have some light shed on this issue - or not. It seems to me that the prudent thing to do is to NOT approve the extension at this meeting, but to use the time between now and the next one, in July, to thoroughly flesh-out the issue BEFORE perpetuating what appears to be a serious mistake. I guess we'll see. The meeting begins at 6:00 p.m. in City Council Chambers at City Hall, 77 Fair Drive, Costa Mesa, CA. The Costa Mesa Parks and Recreation Commission meets again Thursday, June 25th, after missing a meeting last month. The meeting begins at 6:00 in City Council Chambers at City Hall. You can read the agenda HERE. 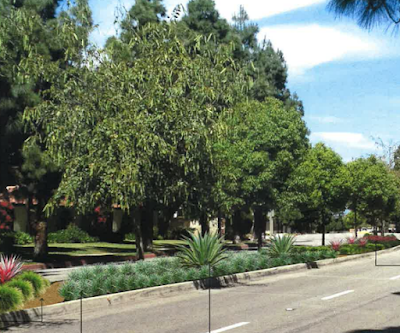 The agenda includes a review of the proposed plant palette for medians on Mesa Verde Drive East and California Street, HERE, in the part of town where the mayor and mayor pro tem live. 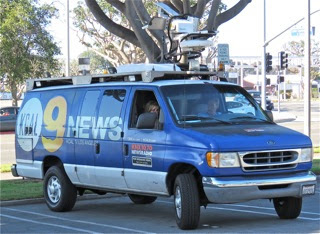 Perhaps the most interesting and possibly controversial issue on the agenda is number 9a, the proposal for a NEW Field Use and Allocation Policy, which is combined with a request for SPECIAL STATUS for some specific youth sports groups: AYSO 97, Newport Harbor Baseball Association, Newport Mesa Girls Softball and Matt Leinart Football. Read that agenda item HERE. Commissioner Bob Graham had requested the temporary placement of a bench near the Canary Drive entrance to Fairview Park for one month to measure public response. That agenda item is HERE. It seems like one month might not be long enough for this evaluation. The final two items on the agenda, HERE and HERE, are tree removal requests on Prospect Place in a neighborhood in which this kind of activity seems to have been on-going for many, many months. Apparently Canary Island Pines, narrow planting areas, block walls and neighbors with allergies are not compatible. Imagine that! Seldom are these issues easy to resolve. I'll attend and report back tomorrow evening. With any luck it will be an early night. 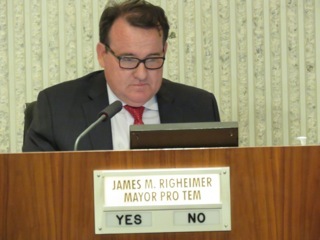 The Costa Mesa City Council met in a Special Meeting Tuesday night to consider the Final 2015-2016 Municipal Budget. 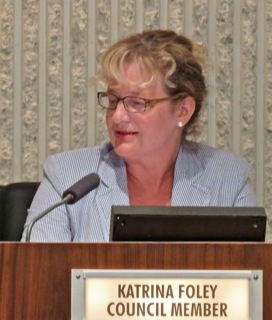 All council members were present, although Katrina Foley showed up 15 minutes late. You can read the staff report, with separate links to nine (9) attachments HERE. 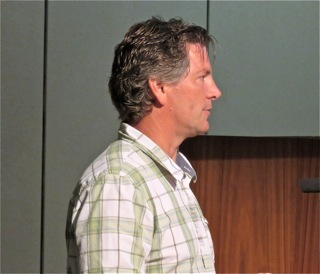 Interim Finance Director Steve Dunivent led the staff discussion, trading off with CEO Tom Hatch from time to time. Of the approximately 55 people in the audience, just about half were staff members, on hand just in case questions were asked of their organizations. Sixteen (16) members of the public spoke and half were what I would describe as youth sports supporters, on hand to praise the council for their plans to make bold moves to provide more playing field time by lighting some and putting artificial turf on others. The other eight (8) people spoke of broader budget issues. Dunivent told us that the Preliminary Budget was $147,835,876, up 5.68% from the year just ending. That amount includes an Operating Budget of $118,083,807 - up 2.72% - and a Capital Budget of 22,299,929 - up 14.82%. Of the $112,954,190 General Fund Budget, 46% is from Sales Tax and 22% is from Property Tax. Of that amount, 54% will be spent on Public Safety - Police and Fire. The Capital Improvement Budget shows 43 projects recommended by the CEO for a total of $22,299,929, of which roughly half - $11,263,536 - comes from the General Fund. Of the remainder, $7.6 million comes from Gas Tax and Measure M2 funds; $1.3 million comes from Drainage and Traffic Impact Fees; $763,889 comes from the Narcotics Asset Forfeiture Funds; $530,296 from Comm. Block Grant Funds and $800,000 from other grant funds. Replace certain leased vehicles -? "IT'S GONNA TAKE MORE MONEY"
During the initial discussion Gary Monahan observed that it's going to take a lot more than $1.9 million to accomplish all the things related to sports fields and was referred to the attachment which shows the planned use of the funds - most of it for design and/or feasibility studies on the projects. The actual construction would be further out. He suggested that, before we get too far down the line on any of those projects that the School District should be consulted about their participation in the project. Frank Albers, who expressed gratitude for the sports fields, lights and related items and observed it's not easy to prioritize these issues. Bob Graham suggested some provision be made for picnic tables in most of our smaller parks so families could find a resting spot in the shade of trees. 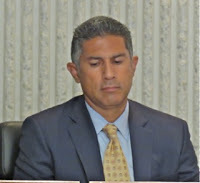 The discussion included the observation by Ernesto Munoz, Director of Public Services, that we do not have a fund specifically for furniture and fixtures in parks - only a maintenance fund. Lou Desandro praised the council for a budget that is balanced both financially and from a resident standpoint. He specifically mentioned the plans for turf and lights. Flo Martin provided numbers that showed that our public safety budget is actually less than the current year, and that the head count in both Police and Fire are down but calls for service are up. Jay Humphrey observed that this budget had the look of funding pet projects instead of doing what is best for the broader community. Robin Leffler echoed what Flo Martin said and expanded on the issue. She mentioned the use of Reserves to keep the city afloat during the economic downturn, but that we've not replenished those reserves yet now that the economy has bounced back. She also wondered why anticipated consulting costs are up 17%. Chris Cox emphasized the need for stadium seats at Costa Mesa High School. Bret Woods expressed the need for a study for lights at Kaiser School, citing a big increase in registrations of his organization, AYSO 97. Cynthia McDonald cited the need for a vision - a plan that meets the needs of all the people, not just a few groups. She cited the need for people to feel safe and referred to the Orange County Business Council report to the Planning Commission that showed the need for more jobs and more dense housing. Beth Refakes stressed the need for more Public Safety staff, agreed about the replacement of the Police Emergency Generator and the need to get buy-in from the school district on field changes. Mark Arblaster expressed appreciation for the budgeted number for lighted fields, citing a decade-long quest on his part for lights. 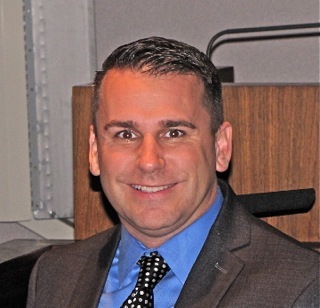 Brett Eckles echoed the need for lighted fields and the need to prioritize those projects. He suggested the Joint Use Agreement needs to be updated and followed. 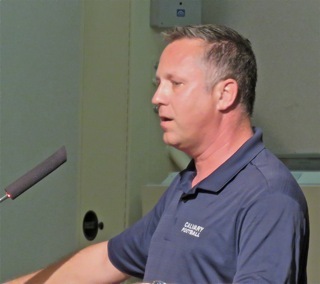 Chuck Perry spoke of the need to work with the school board and thanked his pal, Mayor Steve Mensinger, for meeting with Supervisor Michele Steel to look at Talbert Park recently. 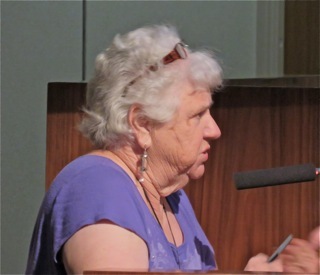 Joanne Purler expressed the need for more fiscal responsibility, particularly managing the pension debt and cited her apprehension about municipal bankruptcy. 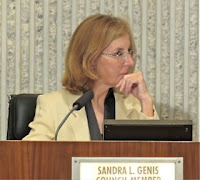 She also cited that she feels less safe in the city now because of delays in response times and the increase in crime. Mary Spadoni expressed concern for the reduced Police Department budget. She wondered why the emphasis was being placed on budget dollars for children when the census shows the city is aging, not getting younger. She also expressed the need to follow the lead of other neighboring cities in establishing a plan to pay down the pension debt. 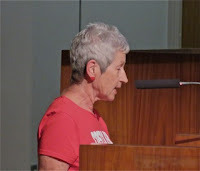 I always find it ironic that fewer than two dozen residents took the time to address the council on the budget. I don't expect to see a thousand people turning out for this meeting, but most of the names above will be familiar to those who read this blog. Many of the same activists take time out of their busy lives to study issues and present their views to the council for its consideration. And, of course, there are special interest groups - like youth sports - that show up when their issue is on the table, like last night. "EASIEST BUDGET IN A LONG TIME"
He observed that there had been no infighting - it was the easiest budget in a long time. I agree - it sure seemed that way. He spoke on many issues, among them park furniture; turf and lights; the re-paving of the City Hall parking lot that's in the budget (Munoz said it's essential to do it now instead of waiting) and collection of Park Fees. Director of Development Services Gary Armstrong advised that those fees - $13,000 per unit - are typically collected at occupancy, so they dribble in during the year. Dunivent does an educated guestimate for the purposes of the budget. 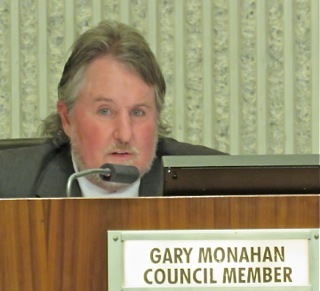 Monahan also addressed the "head count" issue, which is when we learned of the "vacancy factor" that's included in the budget to the tune of $3.2 million. He also stressed the need for more fields. 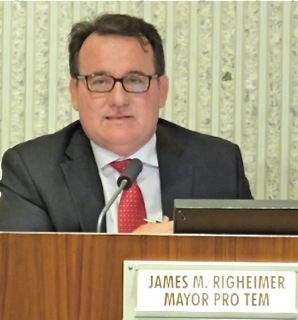 Mayor Pro Tem Jim Righeimer opened his comments by stating, "We have more than enough land in this city to do whatever we want to do." And stressed it was just a matter of prioritizing. Well, I suppose, technically, that's correct. If you throw in Fairview Park and the other 29 parks, we have lots of open space. And, if you factor in eminent domain and his tendency to create ordinances to make existing businesses feel unwelcome, he may be right. Then he said, "Folks, it's going to rain this year - drought over!" So, I guess he REALLY DOES know everything! I just shook my head - but continued to listen because when he gets started on this kind of a roll you never know what he's going to say next. I'm glad I did. He then spoke about the lights and field issues and stressed the need to use the Joint Use Agreement to work with the school district to "get it done!" Then he launched into a mini-rant about Pension debt, the complaints about which he referred to as a "broken record". Attempting to correct the record, he said not all the cities around us are solvent, then said, "Newport Beach is the wealthiest city in the world but has the worst pension debt per person ratio". He told us the employee organizations are just going to have to change their formula to take less for existing employees. He said putting more than the current extra half-million toward pension reduction is futile when CalPERS is raising our costs 50% in the next 5 years. He said there's no reason to throw more money at it. Then he went off on a rant about Reserves, stating that having $85 million in reserves is "nutty". He neglected to mention that those reserves are what got us through the economic downturn, but doing so wouldn't fit his plan. Then he told us that we should be borrowing money for things like new Fire Stations, a new library, etc. instead of paying cash for them. He compared it to the mortgage on our homes. Then came the issue of "motels". You will recall his earlier statements about making the operators of "problem motels" take a "more realistic view" of the value of their properties by squeezing them with code enforcement and police and fire attention. You'll recall we imposed a new ordinance that penalizes the motel operator if their calls for service exceed a specific number. Last night he said, " We will continue to make ordinances that will make it harder to be here." He said "I feel safe in this city. ", but of course, he just said how you "feel" is not important... it's whether you ARE safe or not. He praised about-to-become Chief Rob Sharpnack as the leader we need for the CMPD. I agree. The question in my mind is whether he and Mensinger will not try to micro-manage the department and actually give Sharpnack a chance to do the job. 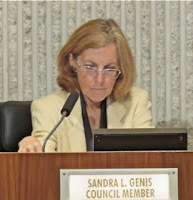 Sandy Genis stressed that this budget was very conservative, and that she was disappointed that we had to use Fund Balance to achieve a balanced budget. She stressed that park lights are a priority and that we should identify parks in need first. She reminded us that 20 years ago, during her earlier tour, there was a move afoot to try to build fields at Fairview Park, which was rejected. However, the upshot of that activity was the acquisition of The Farm, now Jack Hammett, Sports Complex - our premiere sports site in the city. Katrina Foley said there had been a lot to take in, and emphasized that she'd only been on board for half the budget cycle - and observe that it's always interesting when Righeimer speaks. Boy, is that putting it mildly. She said she was not going to nit-pick the budget, but stressed that she thinks we need a long term view. She's been stressing that for months. She said our plans should be sustainable and she's happy that families are getting prioritized. She praised Jake Knapp for his appearance in the U.S. Open Golf Tournament last week as an example of what happens with a supportive infrastructure for the youth of the city. Knapp didn't make the cut, but he did score better than Tiger Woods. She also stressed the need for a good working relationship with the school district and the need for a strong public safety presence in the city. She said we're trending the right way - but the numbers don't support that optimism. She then DID nit pick the budget just a little. The council had agreed to provide $50,000 each to the three high schools that serve the city - Estancia, Costa Mesa and Newport Harbor. She requested that the two Costa Mesa schools receive more - $75,000 - and Newport Harbor receive $50,000. 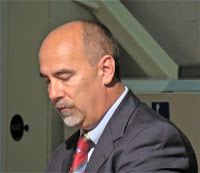 That sent Righeimer into a mild state of apoplexy! He practically jumped out of his chair, berating Foley for "making last minute changes to a budget we all agreed with!" Apparently his memory holds less than 12 months worth of data, because almost exactly a year ago his buddy, the mayor, did precisely that when he yanked $600,000 out of the $1 million library fund to replace brand new median landscaping near his home. I thought Righeimer's head was going to explode - kind of like in "Mars Attacks". 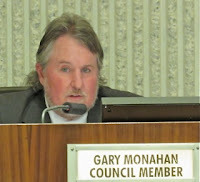 Monahan disagreed with Foley's idea, citing the fact that 60% of the children who attend Newport Harbor High School live in Costa Mesa. 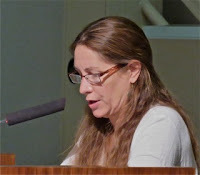 Some people didn't notice that she said the difference would come from the City Attorney's budget, which she said Tom Duarte had agreed to by reducing his budget by $197,000. He said nothing. If that's true, that would make this year's budget even with last year's for that department. Anyhow, this issue didn't get resolved and it may come back to the council at a future date. Mayor Mensinger went last and supported Foley's idea, which launched Righeimer into low earth orbit again. 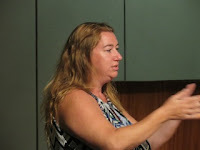 Mensinger stressed the field use issues and the need to prioritize them. He praised the Public Works department and Director Ernesto Munoz specifically for all the good work they've been doing. He gave a kind of pep talk, citing that "positive things are going on." That may be true if you're not a cop or firefighter, who are being required to work backbreaking overtime just to TRY to keep this city safe. 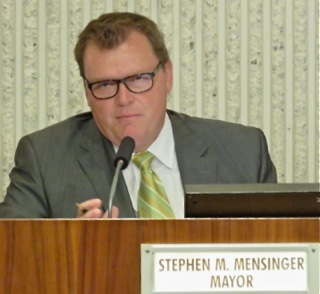 Interestingly, Mensinger said, "the builders are helping us out a lot of ways." and I wondered exactly what he meant. Did he mean in his campaign war chest? He then said, "It's all about families. ", and I wondered if he could be any more disingenuous (which used to be his favorite word until he figured out what it meant). He closed his segment by saying, "We are a great city and it's only going to get better." Well, I'm excited! Are you? Then came the votes on the six items to be considered. Monohan made the motions and various others seconded them. The first two - the Fiscal Year 2014-2015 adjustments and transfers and the Fiscal Year 2015-2016 budget resolution both passed on 4-1 votes, with Genis voting NO, although she was not specific why she voted that way. And the rest - the Partial Park Loan prepayment; the Partial Fire expense reimbursement; Salary resolutions and job descriptions for certain new jobs and Direction on new Fire Fees - passed on 5-0 votes. announcement in a televised public forum last night. Visions of a cat out of the bag bounced around in my head. 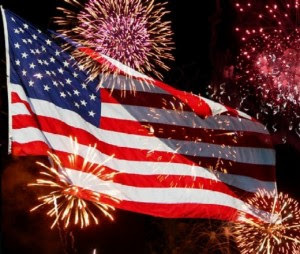 The next council meeting will be July 7th, following the Independence Day holiday.